The Consul General of the Republic of Poland in Toronto Mr Krzysztof Grzelczyk & President of Canada-Poland Chamber of Commerce Mr Wojciech Śniegowski requested the pleasure of your company at the Annual Winter Gathering. 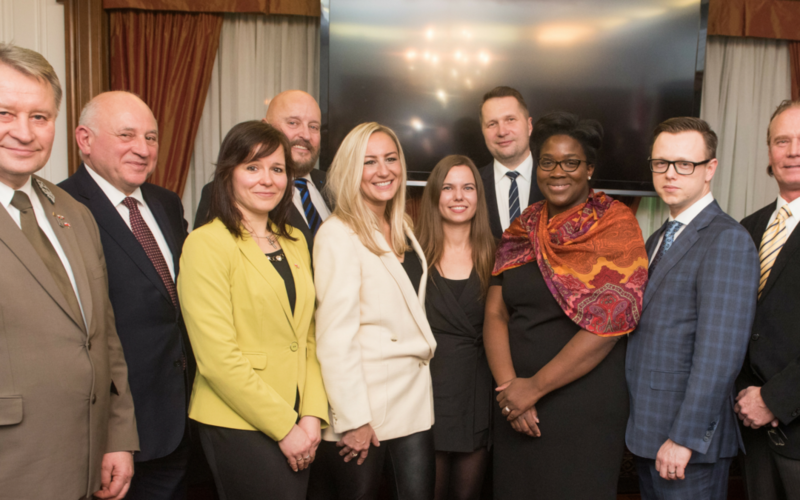 Special guests included Stephanie Dei, We Empower Programme National Coordinator – Canada UN Women​, MPP Kinga Surma – Parliamentary Assistant to Ontario’s Minister of Transportation, and Prof. Przemyslaw Czarnek – Wojewoda Lubelski. SUPPORTING SPONSORS: Musket Transport Ltd.​, Kannuk Vodka​, and Truly You Hair and Scalp Clinic​. Thanks to the hospitality and cooperation of Consul General of the Republic of Poland Krzysztof Grzelczyk, our Chamber had the privilege to host a business mission from Voievodship (Province) of Lublin. Among our Winter Gathering guests, we had representatives of the diplomatic core of EU countries as well as members of European Union Chamber of Commerce in Canada – Euccan, Ontario Chamber of Commerce​, as well as delegates from the Polish Highlanders Association of Canada. The presence of Louie Di Palma Director of SME Programs, Ontario Chamber of Commerce was particularly welcomed as Canada-Poland Chamber of Commerce is looking forward to work with the Ontario Chamber of Commerce to deepen economic relationship between Ontario and Poland through hosting of business missions, organizing seminars and B2B meetings. Official Event Video Recap: 2018 Annual Winter Gathering. Click here to view our official Photo Album from the event. Event Photography Sponsor was Corporate Member, Fotografia Boutique. Letter from Mr. Przemyslaw Czarnek, Voievodship (Province) of Lublin. English translation can be found below. Thank you for the opportunity to participate in an effective and extremely interesting meeting during my visit to Ontario. I am convinced that the established contacts will result in closer ties between Polish and Canadian businesses in the New Year. I am very impressed by the economic activity of Canadian businesses and effectiveness of their politicians. Together with my Team for Contact and Development of Cooperation and the Province of Lublin, we immediately started working on the organization of the Polish-Canadian Economic Congress, which will be held at the Lublin Voivodship Office in Lublin. On the occasion of the approaching Christmas, please accept my best wishes. May the God’s Son give us His favors, strengthen faith, hope and love, and his blessings will fill hearts with joy and peace, so may all under the protection of the Blessed Mother, enter with confidence in the New Year.